Apparently there are people in my country interested in and working with the prechristian religion of our area of whom I never heard. Somehow I ran into an announcement of a newly erected Irminsul (or if you cannot read Dutch, try this Google translation). 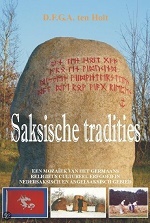 I am not entirely sure what to think of this project, but when I started to look for more information about the people behind this project, I found a book called “Saksische Tradities”, five years old and I never heard of it. The title page says that there are German and English versions of the book. I did find the German one, but not an English version. If there is somebody who can point me to this English edition, please do. Dominick ten Holt stepped into his father’s footstep2 by investigating the traditions of the area where both grew up, the Achterhoek, an area in the Province of Gelderland of the Netherlands. The reasoning is that Saxons lived there and the Saxon area was, of course, much larger. In the Western part is the area where the author is from. To the North it reached the coastal area of the Frisians, then going all the way up to Denmark, the Hartz-area in Germany as the farthest East and the Southernmost part is as South as Köln/Cologne. And of course the Saxons crossed the North Sea to the British Isles. Ten Holt set out to investigate the religion, folklore, customs, etc. of the entire Saxon area thus showing where elements that can be found in Great Britain came from. The chapters sometimes seem especially written for the book, sometimes they are articles that have been published before. They span a variety of subjects spanning from seasonal feasting customs, etymology, expressions of art, folklore, reports of visits of Saxon sites and areas and of course history. The author is fairly fierce towards Christianisation, particularly the role of Charle’magne’ which he dubbed Charles the Butcher (some call him the Saxon-slayer). Inspite of the focus on Saxon history, the author (actually authors, since there are also texts of Jan ten Holt), there is quite a bit of use of Icelandic sources, sometimes a bit too easily too perhaps. This is, of course, inevitable, but I wonder if an uninformed reader will always be able to tell the source of the information. However I laude the effort to give extra attention to the tradition of the particular area and even more so because it is placed in a larger context, but I do not find the book particularly good or convincing. It is mostly gathered information that I already ran into in other places and nothing is specific enough for ‘Achterhoek aha moments’. The book may only be a step up to a larger and better worked out project, but I have not heard of any follow ups of it. A positive side is that the book mentions visit-worthy sites that I was so far unaware of. Some ‘neo’, like the authors own runestone and a stonecircle of a group called Athanor, but there is also information about interesting remains in areas that I sometimes visit, but was unaware of. It looks like the first printing is starting to run out, but the book is not too hard to find second hand. Neither is it very expensive and it is nicely printed and comes in a hardcover with photos and about 270 pages of content.